Tickets for Betrayal are now available! Don't miss your chance to see Olivier award-winning actor Tom Hiddleston in one of Pinter’s classic dramas. Betrayal comes to London’s West End once more! 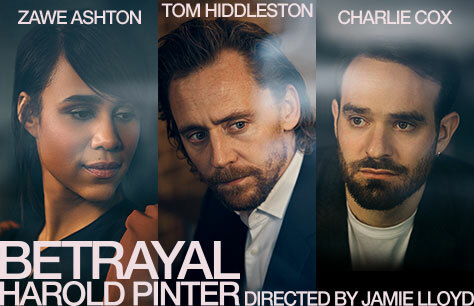 Starring Olivier award-winning international superstar Tom Hiddleston, along with Zawe Ashton and Charlie Cox, this last instalment of the Pinter at the Pinter season promises to be the best. Betrayal is considered one of Harold Pinter’s major dramatic works. This show highlights different betrayals- of a marriage, a lover, of oneself. The show makes use of reverse chronology so we are never sure if what we are seeing is what we think it is. Betrayal is coming to London’s West End for an extremely limited run in Spring 2019. Tom Hiddleston made a name for himself on the stage before he became a household name as Loki in Thor, its sequels and The Avengers films as part of Marvel’s Cinematic Universe. Now he returns to London’s West End in a show by one of Britain's most influential playwrights. Charlie Cox is best known as the star of the Netflix drama Daredevil. He has also played roles in The Theory of Everything, Stardust, HBO’s Boardwalk Empire. His stage credits include The Prince of Homburg, Incognito and The Lover & The Collection. Zawe Ashton is best known for her television roles in series such as Fresh Meat, Wanderlust, Not Safe for Work, and Velvet Buzzsaw. Her previous stage credits include The Maids and Salomé . Last seen in the West End in 2011, Betrayal is poised to take London by storm in Spring 2019. Coming at the end of the Pinter at the Pinter season, Betrayal promises to be a worthy end to this incredible season. Betrayal tickets are sure to be some of 2019’s hottest tickets. Do not miss your chance to see legendary actor Tom Hiddleston star in the final instalment of the Pinter at the Pinter season. Interesting, modern set no scenery at all . Just dialogue between 2 or 3 . Going back in time ! It was ok , difficult to follow at times as fairly quietly spoken! Glad to have seen it ! I really enjoyed this play, the acting was class, and I must admit to being a little star struck!! !